Before we hockey fans had the opportunity to enjoy (or ignore) All-Star festivities in Columbus, Zac Rinaldo decided to prove how valuable he was to the Flyers and anyone that ever thinks of signing him. According to him, he is great at injuring an opponent’s best defenceman so much that he gets him and his AHL-level puck possession ejected from the game. His peripheral numbers are so bad and no NHL coach has ever trusted him on playing any special teams unit, that Philadelphia may just be better playing one less forward than ever have him on the ice for an entire game. Now that every team has played 41 games, I needed to find a seventh team to eliminate from my rankings. Well thanks to your esteemed wisdom Mr. Rinaldo, you made my job easier. The Flyers are out in the latest edition of the Nerdy 30. As much as this team has two of the best players in the world in Claude Giroux and Jakub Voracek; players like R.J. Umberger, Andrew MacDonald, Chris Pronger, Vincent Lecavlier and Rinaldo will forever prevent this team from ever becoming a playoff team, let alone a Stanley Cup contender while they are on payroll. Frankly, I have already made my opinions on this team here, here and here and not a single bit of it has changed. 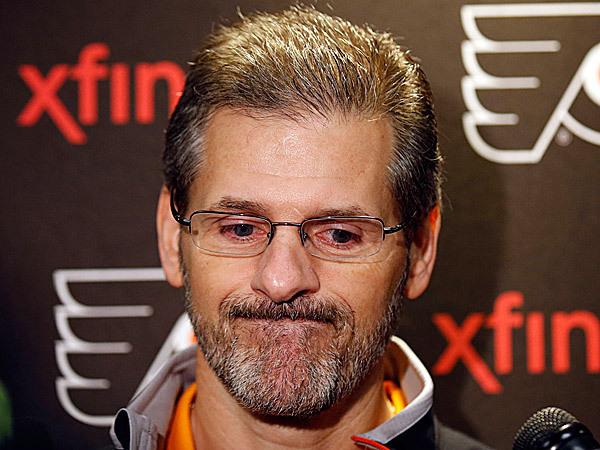 Only Minnesota can be a more frustrating franchise to watch in the NHL than Philadelphia. Before we talk about Calgary, I never had the chance to explain Hartley Magic. The definition is simply that Bob Hartley will make you team better despite the fact that you will always be terrible in puck possession. 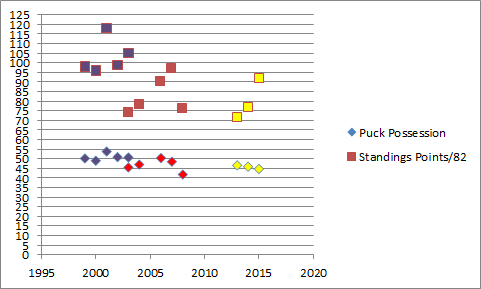 Want proof, here is a table showing what his coaching career has looked like in puck possession and in the standings. purple = Colorado tenure, red = Atlanta tenure, yellow = Calgary tenure. All data from 2007-08 to 2014-15 is score adjusted corsi for percentage from puckon.net. All date from 1998-99 to 2006-07 is shots on goal for percentage from nhl.com. The only time a Hartley-coached team was an elite possession team was in 2002, the year Colorado won the Stanley Cup. You’re meaning to tell me that with players like Peter Forsgerg, Joe Sakic never knew what it was like to play modern day hockey, yet still won so many games in the late 90s and early 2000s? No wonder why the Avalanche fell apart so fast after they retired. The Flames just refuse to die and they are still an embarrassing puck possession team. Now [my name is] Jonas Hiller’s numbers have fallen off a cliff since the hot start that was mentioned 10 weeks ago. Now he is sitting with a 45.8% quality start percentage and despite being a top-ten goaltender at even strength, Hiller is the worst in the NHL when it comes to stopping pucks on the penalty kill. Fortunately for the Flames, they have only been shorthanded 113 times in 46 games this year, which is the lowest in the league by a full 10 opportunities. Another thing to look at is the team’s Hextally. Last year, the Flames shot the puck very frequently from the left-handed point position. Now they are attacking from the middle between the top half of the faceoff dot. It’s not the makings of a great possession team one bit, but according to Tom Awad in the latest version of Rob Vollman’s Hockey reference (page 34), the difference in those two areas is shooting at 7-17% on average versus 4-10% on average. Bob Hartley. His magic is always true. After many weeks wondering if Winnipeg can prove that their quality five-on-five play can place them among the best in the toughest conference in the NHL. Now that we are at the halfway point of the season, I think it is safe to say that it has. They are one of the deepest rosters from inside and outside the NHL roster and have been one of the league’s best shot suppressors. They are so young that they might have to start thinking about putting in 24-year old Michael Hutchinson as their starting goaltender come playoff time. While current starter Ondrej Pavelec is 19th in even strength save percentage, Hutchinson sits in 4th amongst all those that have played more than 750 minutes. Roughly the same applies to their save percentage ranking when shorthanded and this is important. While the Jets give up the second fewest shot attempts per 60 minutes on the kill, they do so while committing the most shorthanded opportunities at 200; 29 more than the second place Pittsburgh Penguins. If the season were to be over, Winnipeg could be playing Chicago in round one of the playoffs. If they find miracles to beat the Stanley Cup favorites, they’ll have to play the run-and-gun Nashville Predators in round two. Again, the Central Division is really hard!!! That being said, we were at this point last year where we wondered whether or not Pavelec was a viable starting goalie. This year, he is, but Hutchinson is better and with Eric Comrie or Connor Hellebuyck waiting in the wings in goal too and the likes of Josh Morrisey, Nic Petan and Nicolaj Ehlers ready to get promoted within the next year or two, Kevin Cheveldayoff and Paul Maurice can not afford to mess up something as “simple” as a goaltender controversy. Speaking of the Pittsburgh Penguins, here they are falling in the rankings despite beating the Jets last night. Like Philadelphia, this is a team full of problems that can’t be fixed in the short term because they are so tight up against the salary cap. Yes, Pittsburgh is good enough to make the playoffs as long as Sidney Crosby and Evgeni Malkin are on this team and yes, all the mistakes and years of bad drafting are more Ray Shero’s fault than Jim Rutherford’s, but like Philadelphia, once you hit the cap, your margin of error is essentially gone. That’s why a trade like the one to acquire Maxime Lapierre set the hockey twitterverse on fire yesterday. I still stand by the fact that Marcel Goc would have been a great fit for the Pens, but when you’re playing with Tanner Glass all the time, how can you play well? Yes, we are quibbling about depth forwards because, again, like Philadelphia, Pittsburgh doesn’t know how to use them since Maxime Talbot and Jordan Staal left and Jim Rutherford has no track record of proving that he can do better from his days in Carolina. Are you really telling me that Blake Comeau, Marc Arcobello, Bryan Rust, Andrew Ebbett and Craig Adams’ rocking chair are going to carry you far in the playoffs? Kasperi Kapanen is, by far, Pittsburgh’s best prospect and Rutherford should be given credit for that for picking him in the first round, but if we were to use rudimentary NHL equivalencies, he is only on pace to record 10 goals and 19 points per 82 games if he played in the NHL in his draft+1 year (this is assuming Kapanen continues to be on pace to play 37 SM-Liiga games). If he maintains how he’s playing with a full 60 league games under his belt next year, that 82-game pro-rated NHL season only improves to 14 goals and 24 points. That’s clearly not good enough to make an impact at Pittsburgh next year or the year after and however you feel about Derrick Pouliott, Scott Harrington and Simon Despres, a ton has to be done to fix the Penguins roster while Crosby and Malkin are still enjoying their 20s.